Question of the week: I have lots of photos on my phone from summer vacation. How do I back them up so I don't lose them? These days we keep everything from photographs, videos and music to messages and contacts on our mobile devices. This makes losing our phones a big headache. Unfortunately, most people don’t think of this until after their phone is missing or fails. We asked our users if they back-up their data, and a whopping 49% said they don’t back up or don’t know if they do. Source: Survey results from 'Do YOU Protect Your Mobile Data?' April, 2014. Avast Mobile Backup makes backing up your important data easy for you. In a few easy steps, you can backup all your files from the pictures of your last trip to the contacts and applications you keep in your devices. Install Avast Mobile Backup & Restore from Google Play. 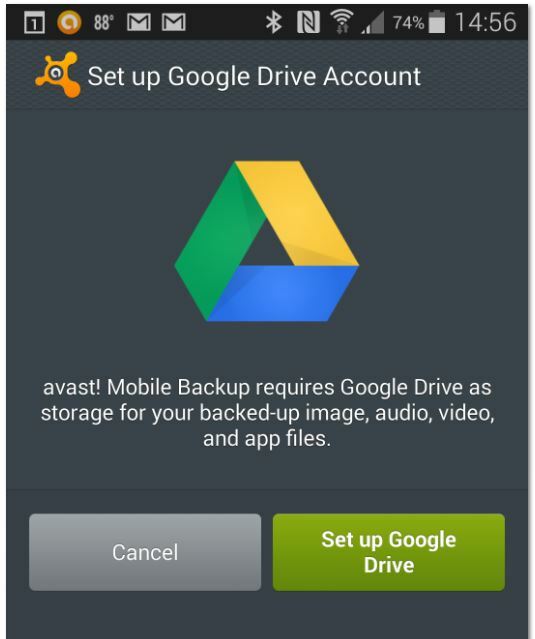 Once you have installed Avast Mobile Backup, you'll need to configure your Google Drive. It's as simple as clicking on the button "Set up Google Drive Account" and follow the simple steps on the screen to access your Google account. Once you've set up your Google Drive, you can select items for backup. The free version lets you back up contacts, calls, and SMS. The Premium version also allows you to back up all the audio and video files and also all your applications. When you finish the selection, click the "Continue" button. On the next page, "Important Options", you can select whether you want the backups to be made only through a Wi-Fi connection in order to save mobile data, and configure the maximum size of the files which you want to perform that backup. Once you've configured everything, click Finish. You are now ready to perform the backup. Tap the dark square at the top and Avast Mobile Backup will start backing up your files. If you want to restore your backup when you change your phone, simply reinstall Avast Mobile Backup, click "Browse backup" and then "Restore all."